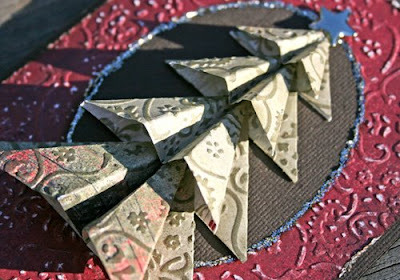 My Creative Existence: Origami Christmas Cards! I was blog surfing this morning and came across a fabulous card on Shirley Fyfe's blog that I was so amazed by I just had to get my supplies out and create my own right away! The original idea came from Karen at Stampingvideos and you can see the instructions and youtube demonstration here. I have used Bazzill cardstock as my base card, and Basic Grey patterned papers from the new Wassail range. 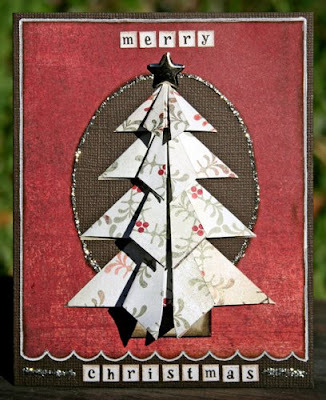 I added a metal star to the top of the tree, and Carolee's creations tiny letter stickers for the greeting. There's also some silver Kindyglitz, and white Gel Pen. To create that gorgeous scalloped border you see there I used a border punch that was kindly sent to me by the good folks at Stampin' Up! (Keep an eye out at Inkurable for more SU goodness). 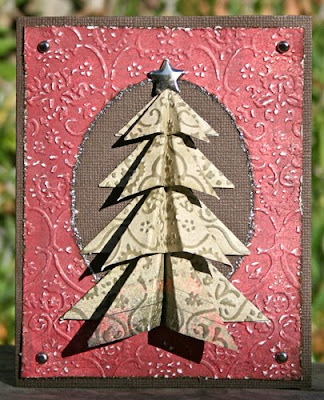 I embossed both the background paper, and the paper I used to create the tree with. I inked over the raised parts of the tree, and for the background I distressed the raised surfaces using sandpaper. Again, Kindyglitz and a silver star were added to finish the card. I loved making these cards! So different from anything I've done before! It's not as hard as it looks, so I urge you to give it a go! (And don't forget to point me to your blog so I can see what you did!). These both look absolutely stunning Sarah! 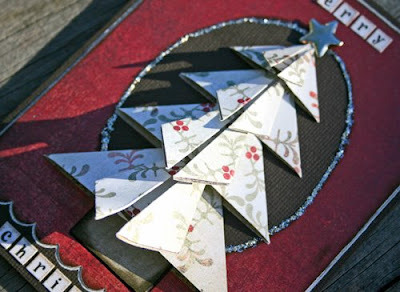 I love the added dimension you have added to the background of each card too - just perfect! I'm glad you were as inspired by these trees as I was too! I absolutely love your cards! I would like to email you but can't find your email, can you send me a quick email if you have a chance? Thanks! Back again - I just wanted to let you know that I've left a little something for you on my blog! This card is soo cool, luv it hun! your cards are so much more stunning. absolutely love it! Loving the origami cards Sarah. Gorgeous. I really love the beautiful soft tones you've used in creating them too, lovely Work! Another amazing card by the ever so talented Sarah! !